"If atheism is a religion then not collecting stamps is a hobby..."
A comment from Cloud Soup under "In brief - Sun, 4 Mar, 2007"
UK Comedian Robin Ince talks about Creationism and Intelligent Design. From the show "Comedy Cuts" aired 2007/03/15 on ITV in the UK. Sue Blackmore, the author of a Comment is Free blog, has some interesting things to say about it in the comments section of Richard Dawkins’ website. Firstly, the reason the news reported in her comment was old is because the article was written two weeks before it was published. The topic was considered so controversial that the editor of CiF had to personally approve it, and several phone calls and emails were exchanged before it was finally posted. Secondly, the article which Sue originally submitted contained this link to the 12 Motoons, but when it appeared on CiF the link had been replaced with this one - a Guardian story about them. The editors at CiF are so scared of offending Muslims that they won’t even link to the Motoons, let alone publish them. 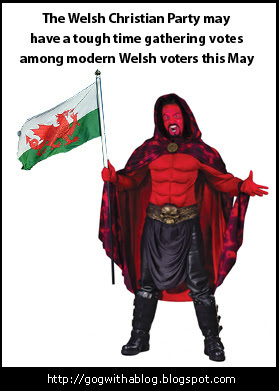 "Rev David P Griffiths from The new Welsh Christian Party declared it an “outrage” that various government, housing and tourism bodies in North Wales associate themselves with a symbol of defeat and Satan – the dragon." from Why won't God heal Amputees?